When you aren't able to reach Google, or one of Google's services, how are you supposed to tell if it's down or everyone, or if it's just you? Even if it seems like Google is down, the problem may be with your computer or device, modem or router, or even your internet service provider (ISP). 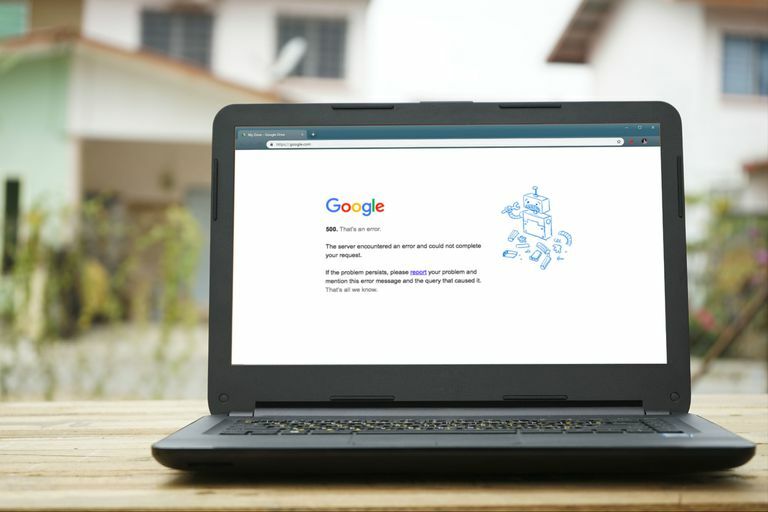 It can be difficult to determine the exact reason that Google isn't working for you, but there are a handful of ways to see if Google is actually down for everyone, or if it's more likely to be a problem on your end. Keep reading to find out what you need to do to figure out if Google is down for everyone, or if it's just you. Are you actually experiencing trouble with your Google Drive and not Google itself? This tells you how to check on Google Drive issues. Do You See An Error When You Try to Access Google? When you aren't able to access Google, or one of Google's services, you will sometimes see an error message in your browser. If you do see an error message, or an error code, it's important to write it down, because it may help you figure out what the problem is. Google error messages aren't always perfectly clear, and it isn't always easy to figure out the problem just by reading the message. It's still important to write the message down though, because it may be the key to figuring out if Google is really down, or if it's just you. When you try to access Google, and you see any of these error messages, it usually means that Google is having trouble. To determine whether that's actually the case, and that the problem isn't on your end, check out the troubleshooting steps below in the "I Think Google Is Down Just for Me! Is There Anything I Can Do?" section. If you try to access Google, or any Google service, and you don't see an error message at all, that's an indication that there's something very wrong with either your internet connection or Google's servers. You can check to see if others are experiencing the same problem, using the tips below, but your first step should be to verify that your device has a solid internet connection. For example, if you're reading this on your phone because your computer isn't able to access anything at all, that's would indicate that there is a problem with your computer, your network hardware, or your internet service provider. In some cases, you'll see an HTTP status code error instead of a Google error message. When that happens, the first thing you should do is verify that you're actually able to load websites other than Google. If you aren't able to access Google, and Google services like Gmail and YouTube, but you can view other websites, then continue on to the next section for troubleshooting tips. If you see an HTTP status code when Google fails to load, that can actually be helpful in the diagnostic process. The three codes that you're most likely to run across include 500 Internal Server Error, 403 Forbidden, and 404 Not Found. You may also see a variety of other HTTP status code errors. Each of these codes indicates a specific type of problem, so check out the links for specific instructions. "I Think Google Is Down for Everyone! How Can I Be Sure?" If you think that there might be some type of problem with Google, and everything is working fine on your end, your first step should be to confirm that suspicion with a little research. By either confirming that Google is down for everyone, or discovering that it works fine for other people, you'll be able to determine the best course of action. If the problem is on Google's end, you'll have to wait for them to fix it. If it's on your end, keep reading to find some useful troubleshooting tips later in this article. Here are the steps that you should take, in this specific order, when you suspect that Google is down for everyone. If you aren't sure where to start, this is a good place. Check the G Suite Status Dashboard. The G Suite Status Dashboard is a good place to check for information about downtime and connectivity issues with Google or any Google services. If a lot of Google services are experiencing issues, that's a good indication that Google is actually down for everyone and not just you. The G-Suite Dashboard doesn't include an entry for Google.com, so it won't actually show you if the search engine itself is down. If most or all of Google's serves are down, however, that's a good indication that they're experiencing difficulties. When a site or service like Google really goes down, it can tremendously inconvenience a lot of people. That makes social media a great place to look for information about an outage, since there's a good chance that people will want to talk about the problems that they're having. While you can also check out Facebook and other social media platforms, the immediacy of Twitter, and the prevalence of hashtags, makes it a good first stop. If you see a lot of people complaining about Google, there's a good chance it's down for everyone, and not just you. You can use the link above to find tweets with the appropriate hashtag, but make sure to click Latest to see recent tweets instead of older ones. If you aren't able to find an answer from those first two options, you may want to consider checking a third-party status checker website. Here are some good places to check: Down For Everyone or Just Me, Down Detector, Is it Down Right Now?, Outage.Report, and CurrentlyDown.com. "I Think Google Is Down Just for Me! Is There Anything I Can Do?" If you look for evidence that other people are having trouble with Google, and you don't find any, there's a chance that the outage could be brand new. In that case, you may want to wait a few minutes to see if reports start rolling in. However, there's a much better chance that the problem is just on your end. Most problems that prevent you from accessing Google are related to your network hardware or your internet service provider, or you could be dealing with some type of malware. Verify that you're accessing the real Google.com site. Due to the enormous popularity of Google, there are a lot of fakes that are designed to phish your information. There's also a chance that you may have typed the address wrong. Before trying anything more complicated, go ahead and try clicking the link that we provided above. It goes straight to Google. If you're able to access Google through that link, you don't have to take any further action to fix things. However, you will want to update your bookmarks, if you were trying to access Google through a bookmark. If you clicked a suspicious link in an email, consider changing your Google password immediately, and enable two-factor authentication to prevent anyone from stealing your account. Are you trying to use Google through a web browser on your computer? If so, then try the Google app on your phone or tablet. In some cases, Google web search will go down, while the app continues to work. You can find the official Google apps for iOS on the App Store, and for Android on Google play. If you're able to access Google through an app on either your phone or tablet, but not a web browser on your computer, the following troubleshooting steps may help you get things working again. However, there have been cases where Google web search was down without impacting the Google app. Try to completely shut down your web browser, and then attempt to access Google again. You'll want to close every browser window you have open, then wait 30 seconds. You can open the browser again after 30 seconds have passed, and try to access Google. If you have another browser on your computer, check to see if you can access Google with it. If you can, that means there's a problem with your original browser. Closing your browser windows doesn't always cause the browser to actually shut down. When that happens, restarting your computer or device is the easiest way to force the browser to shut down. Clear your browser cache, and then try to open Google again. Clearing the cache is an easy step that can fix a lot of problems, and it won't log you out of any websites that store your login information. Clear your browser's cookies. This is another quick and easy fix that takes care of many browser-related problems. However, clearing cookies can have additional, unwanted effects, like removing customized settings on some websites, and removing stored login information. Scan your computer for malware. One of the ways malware can dig in and prevent you from removing it is to cut off your access to help. In some cases, this manifests by preventing you from accessing search engines like Google. If you are infected, and you remove the malware, that should restore your access to Google. Restart your computer, if you haven't already done so. This may seem simple, but restarting a computer can actually fix a lot of weird problems. If you normally leave your computer on for very long periods of time, this is especially likely to help. Restart your modem and router. If you can access websites just fine, and Google is the only thing that doesn't work, this is unlikely to help. It's more likely to help if you have trouble accessing a variety of sites and services in which case it will typically fix the problem. If you've tried all of our suggestions, and you still can't access Google, you're probably dealing with some type of internet problem. The issue may be with your ISP, or located somewhere between your local ISP and Google's servers. This is even more likely if there are a variety of sites, in addition to Google, that you can't access. Your problem could be simple, like having too many devices connected to your network, or not enough bandwidth available. If none of the devices on your network can access Google, then all you can do is contact your ISP, or hope that the problem to sort itself out. While this isn't very common, there is a chance that you can't access Google due to issues with the path that your computer or device is trying to use to connect to Google's servers. The easiest way to fix a problem like that is to use a different DNS server. If you aren't sure what a DNS server is, you're probably using the ones that your ISP assigns automatically. In that case, take a look at our guide to changing DNS servers for the next steps you should take, and check out our list of Free & Public DNS Servers for some good alternatives.